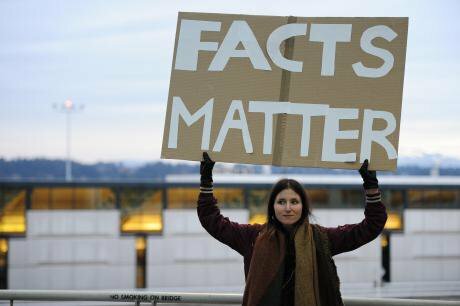 A woman holds a "facts matter" sign during a demonstration against President Trump's immigration ban at Portland International Airport in Portland Ore., on January 29, 2017. Alex Milan Tracy SIPA USA/PA Images. All rights reserved. Sectarianism and tribe are new words being used to cover US elections although their reality has been there for anybody who wanted to see for some time. Was the election of Trump a Russian conspiracy or was talk of such a conspiracy a sophisticated liberal conspiracy to bring down the republican candidate?